July, the monsoon season has started and it’s time to award our awesome commentators with the well-known Top Commentators Award. But if you haven’t been following our posts regularly then you won’t be aware of the change I made in between; to decide upon the Top Commentators Award. You can refer a previous post about the Top Commentators Award chosen by a Random process, where I have explained what’s the change and why that change was necessary. It was encouraging to see from the post’s comments that, apart from 1-2 readers majority of them liked this move of awarding the Commentators by a random process. I was also delighted to see some genuine comments waiting for approval. So the goal behind implementing this move has certainly worked. So, as per the new method i.e. 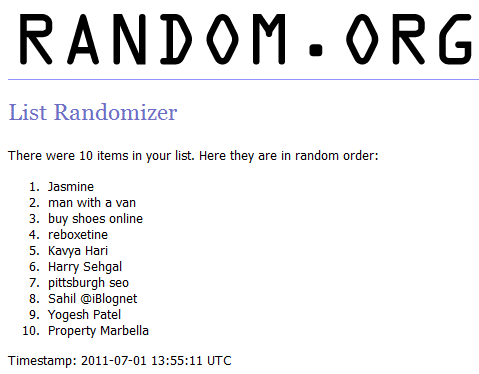 using the Random.org List Randomizer the winners of the Top Commentators Award for June 2011 are ‘Jasmine‘ and ‘man with a van‘. Congratulations to both of them. I wish luck to the others who weren’t lucky enough this time around. Don’t be sad, you might be the winner of the next month’s award. Above is the screenshot taken right after the List Randomizer displayed the result. I would take this opportunity to ask Jasmine and the other person to send me 125*125 banner with the site link so that I can put up your banners on DailyBlogging. Thank you all for participating and supporting us with your gracious comments. Keep supporting and continue helping in making DailyBlogging a better place. I will be coming up with the Traffic Stats within a couple of days and a Giveaway of BT Engage Invites. So stay connected and Subscribe to Our RSS Feeds / Daily Updates. Whoa… That was too quick!!! Congrats to top 10 commentators. I just have to congratulate Jasmine and Man with a van for the winners of the Top Commentators Award for June 2011. Maybe it will be my turn next month. Congratulations to both winner who are winning awards. Congratulations Guys. Watch out people, I think it’s my turn now! Congrats to those who made it to the top 10 last month, I was busy studying for an exam last month so I did not have time to comment here but hopefully I will be back for the next month! Congratulations to all the winners. I would say that commending those top commentators for the week/month is a very good idea to create a network and build trust among visitors. What about the results for the month of July?. Congrats to the winners and hopefully i made it on the list this past month. I will be next Top comments from next month.